14 Karat Gold 1/4 C.T.W. 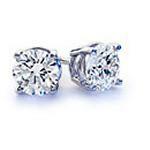 Diamond Stud Earrings - . No jewelry box would be complete without these classic stud earrings. Two sparkling round diamonds (1/4 carat weight) glow in a rich setting of 14 karat yellow gold. For a truly elegant look at a great price. Also available in white gold.